Free up your time and staff – outsource to DOCSOL. By making the most of the latest equipment, it can often be more cost effective to let us do your bulk copying for you, rather than use your own slower equipment. Our experienced team will ensure that you get the best advice, highest quality and fastest possible turnaround. Why invest in expensive equipment and staff when you can e-mail your documents to us ? We offer black and white or full colour copies in a range of sizes from either hard copy or electronic format. Make a presentation look fantastic with a full colour poster print or forward your CAD drawing to us for printing. 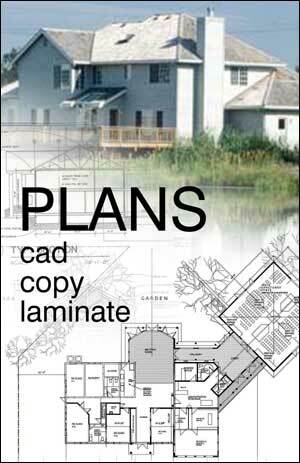 Did you know – we can even copy building plans and maps up to 25 metres long! Our ‘send and receive’ fax service will even allow you to forward A3 size documents and provide a detailed transmission report to any international destination. We also have an emailing service as well. As specialists to the construction industry, we have supplied b/w and full colour CAD printing and copying services. We reproduce drawings from tracing or paper originals up to 25 metres in length. Our clients include, architects, engineers, builders, estate agents, developers, local authorities and individuals who are ‘self building’. During the construction process, many of our clients protect their valuable site drawings with our heavyweight lamination, reducing the need for multiple reprints, especially if it’s raining on site! We’ll print them out & fold them if required. We can print fresh and crisp images up to one metre wide and any length you choose! Whether it's to be back-lit, suspended or stuck down – supply your own design or use our design service and we will produce it for you. 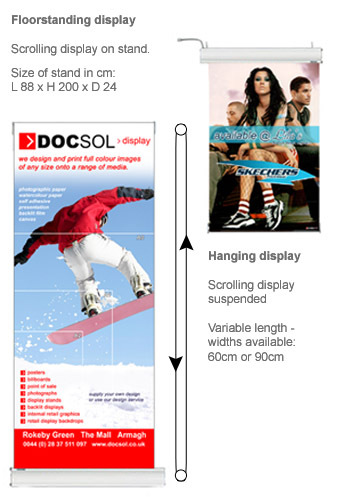 DOCSOL supply many local businesses with an extensive range of display and sales promotion material - full colour window posters, point of sale cards, advertising images and full colour leaflets. Don't worry if you are a small, single outlet business - because printing single one-off posters is no problem. 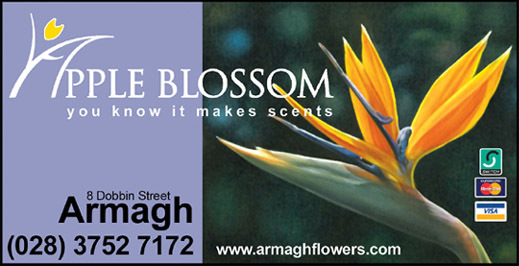 We can even match your window poster with your flyers, press advertising and web image. are an easy way to transform small display areas usually 2 metres x 1 metre. These allow you to look professional, and give impact to your product or service. They are easy to fix to display panels and after, roll up for easy storage. Provide us with good digital images, your logo in electronic format and any other information you require and we will work with you to create the ultimate display. All of our exhibition backdrops are matt laminated giving a durable, easily cleaned surface, whilst preventing glare from overhead lighting. 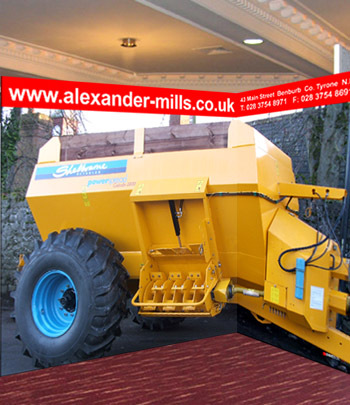 Add motion to your message with a motorised display. Motorised displays add a new dimension to your exhibit as the continuously rolling banner attracts attention because our eyes are drawn to motion. This system allows you to show more content in a smaller amount of space than traditional displays and are ideal for product launches, advertising and retail marketing as a way to increase your advertising potential. 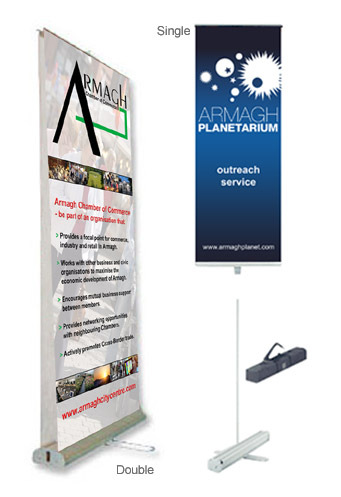 This rolling banner display has a quiet electric motor that rolls the looped banner continuously. This stand has twice the display area of other single sided banner stands as the printed banner loops behind the unit. The continuously rolling banner moves your message in one constant direction - up or down. your business premises for continuous promotion. Fool proof operation and easy transportation make this roller banner stand a winner. Roller Stands are available in both single and double-sided versions and come complete with a carry bag and full colour graphic which can be changed as your business changes. This stand is ready to use in just a few seconds. Whether you are using it for sales presentations or incorporating it into a larger exhibition display, simply take the tough cassette out of the padded case and pull out your graphics. When you have finished your presentation, simply let the graphics slide back into the spring loaded cassette - What could be simpler?